The blue/green world is losing her colors, flavors and grace day by day. Let's save our planet. Let's help our mother nature in whatever way possible. Nature of is beautiful, wonderful and cool. Learning more about nature is very satisfying. Some people though, may be unable to learn more about nature because of tight schedule and other reasons. Read this article to learn some random cool nature facts. The more you know, the happier you become. I remember when i was a child. Our teacher told us that animals breathe in oxygen and breathe out carbon dioxide. She told us that for plants, the process of respiration is the exact opposite of that in animals. We had to believe her because that's what everyone would say. I kept holding on to this belief until we were taught plant respiration in my 200lv. We were all surprised and didn't want to believe our lecturer when he told us that every aerobic organisms breathe the same way -oxygen inhaled and carbon dioxide exhaled. The thing is that plants also undergo photosynthesis.This means that for plants, they respire and photosynthesize. For photosynthesis to take place, there must be sunlight (or light which the plants can photosynthesize with). 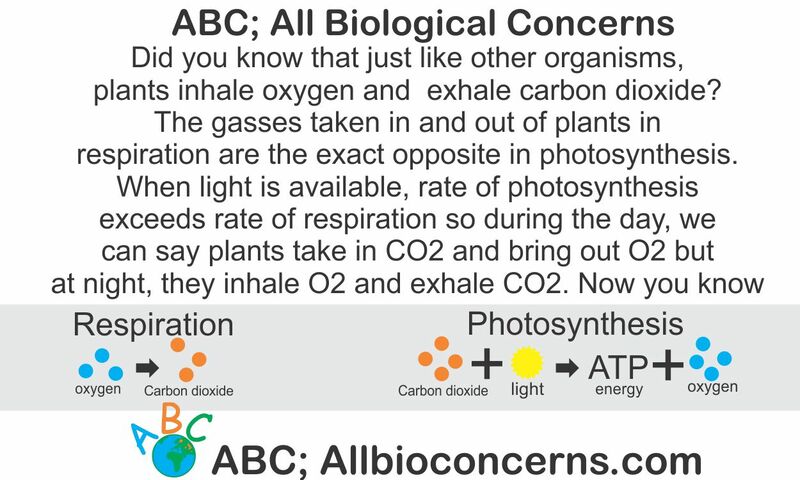 Photosynthesis also requires carbon dioxide to function. As the end result, photosynthesis produces nutrient (carbohydrate, energy, ATP, whatever you call it) and also produces oxygen as a bi-product. 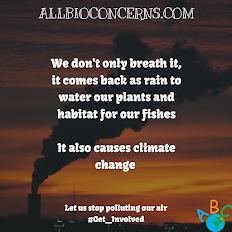 The amount of carbon dioxide taken into the plant by photosynthesis exceeds the amount of carbon dioxide taken out of the plant by respiration so during the day, we can say that more carbon dioxide is taken into the plant and more oxygen is taken out. 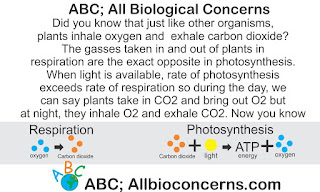 When there's no light (at night) however, photosynthesis cannot occur so plants inhale only oxygen and exhale carbon dioxide. This means that we should not go too close to big trees at night because we'll be inhaling carbon dioxide from the plant. Euglena is under the kingdom Protista. The kingdom Protista is a kingdom characterized by unicellular eukaryotic organisms (solitary organisms with nucleus and more complex cell organelles) like Amoeba, Paramecium, etc. All the Protists organisms can be classified as animal-like or plant-like. This classification is based on how they gain nutrient. The animal-like ones gain nutrient by feeding on organic components of their environment and/or feeding on smaller organisms while the plant-like ones gain nutrient through photosynthesis (This means they have Chlorophyll). Euglena as an organism is both animal-like and plant-like. It switches to the best method of gaining nutrient with the availability of sunlight. Viruses are in the thin line between organisms and objects. For something to be classified as living, it has to have the characteristics of living things; movement, respiration, nutrition, irritability, growth, excretion, reproduction, death, etc. Viruses cannot do most of these on their own. For viruses to function, they need to be in a host cell. When outside a host, Viruses are as useful as useless. Without the organelles of its host, a virus cannot reproduce. Asides the characteristics of living organisms, viruses are very simple in structure; they're just composed of a nucleic acid (DNA or RNA, never both) inside a protein case, also having slight differences in their outside structure with regards the type. 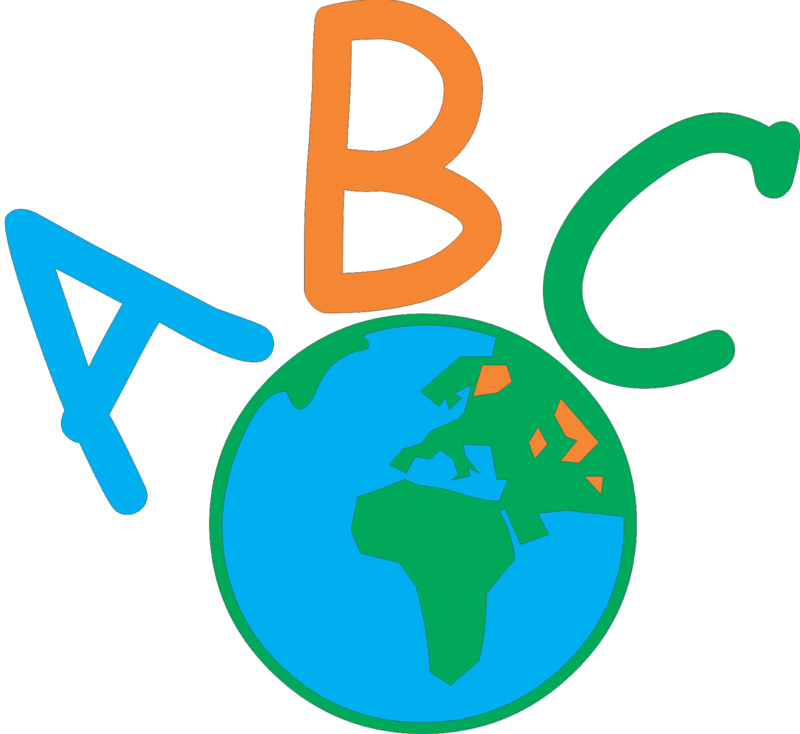 What the viruses do is that when they're inside their host, they insert their nucleic acid into the nucleic acid of their host. With this modification, the host will start producing more viruses with identical nucleic acid as the one inserted in it. When the host has expanded and cannot hold more viruses, it bursts and releases the already made new viruses into the environment. These new ones will then drift to new hosts. Yes, they do communicate and with and help each other. The question now is 'how?'. Trees on their own cannot help each other but for a forest to be complete, it has to have a range of organisms from trees to other organisms like animals, protists, fungi, etc. 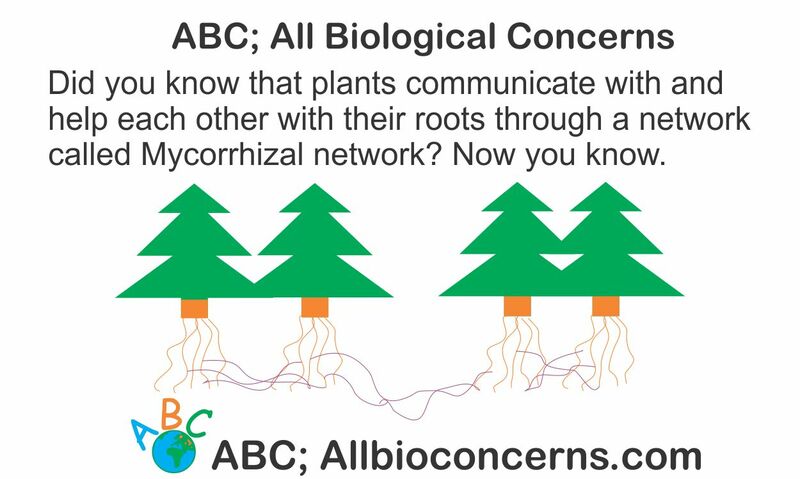 Trees can achieve this social network with the help of fungi. Organisms in kingdom Fungi aren't photosynthetic so they gain nutrient from the environment. Saprophytes grow on dead decaying organisms. Others grow on the roots of different plants. These fungi which grow on the roots of plants may grow on thee root of one or more plants at once. They can now receive excess nutrients from the plants they're anchored on. A recent study has shown that they can also transfer nutrients from one plant to another. That is a plant with more nutrients can help a plant with less nutrients with the help of fungi. 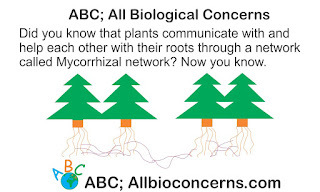 This network of the roots of different plants connected with each other though the help of fungi is called Mycorrhizal network. It is very important because taller plants get more sunlight than shorter plants. Through the help of the fungi, taller plants can help shorter plants. You may know different types of viruses and you may even be scared of all. The fear is normal because 'virus' is now a bad term. For a virus to function, it has to enter its host. What most people don't know is that each type of viruses have their own preferred host. 'Preferred' isn't even the right word to use. For a virus to be able to enter its host, it has to be recognized as friendly. It can be recognized by he host when its surface matches the receptor molecules of the cell. The identical nature of receptor molecules on the surface of cells is the only way organisms can be multi-cellular. If the outside structure of the virus does not match the receptor molecules of the cell, the virus won't be able to enter. This is why HIV cannot infect other cells in the body except the immune cells. Its structure matches only the receptors of human immune cells. And so what? Right? Well, it may surprise you that for an organism to be a bacteria, it must be prokaryotic. A prokaryotic organism is an organism without a nucleus and one which has lesser amount of cell organelles as opposed to eukaryotic organisms. Only eukaryotic organisms have chlorophyll. Chlorophyll is a special pigment that aid in photosynthesis. Cyanobacteria however, have chlorophyll. This means it is the only bacteria, the only prokaryotic organism that can undergo photosynthesis. As a matter of fact, scientists are suggesting (with the theory of endosymbiosis) that eukaryotic organisms evolved from other prokaryotic organisms that devoured on cyanobacteria. That however will be a discussion for another day. Did you learn something new today? Please do well to share your thoughts in the comments section below. Also help me by sharing the article with your friends if you loved it. Thanks very much.